Engaging drama, enlivened by a trio of terrific performances from Hoffman, Keener and Walken, though the script occasionally feels a little contrived. 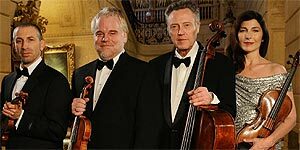 Co-written and directed by Yaron Zilberman, A Late Quartet (not to be confused with the recent Quartet) is set in present-day New York and stars Philip Seymour Hoffman, Catherine Keener, Christopher Walken and Mark Ivanir as Robert Gelbart (second violinist), his wife Juliette Gelbart (viola player), Peter Mitchell (cellist) and Daniel Lerner (first violinist), members of a world-renowned string quartet called The Fugue Quartet. When Peter is diagnosed with Parkinson's, he announces that their upcoming 25th anniversary concert will be his last and that they should find a replacement cellist. This, in turn, exacerbates a series of tensions within the group: Robert proposes that he alternate first violin with Daniel, only to be overruled by both Daniel and Juliette; furious at his wife's lack of support, he lashes out by having a one-night stand. Meanwhile, Daniel (himself an ex-lover of Juliette's) begins sleeping with Robert and Juliette's daughter Alexandra (Imogen Poots), to whom he's been giving violin lessons. Needless to say, the performances are excellent and it's a treat to watch Hoffman and Keener sink their teeth into these parts, even if neither of them are really stretched that far in the process. By contrast, Walken seizes the opportunity to deliver a more emotionally charged performance than we're used to seeing from him and there's strong support from both Ivanir and Poots, both of whom do a good job of selling the sharply-observed nuances of their illicit relationship. On top of that, Zilberman makes strong use of some authentic, wintery New York locations and the music is predictably excellent, though trained musicians probably shouldn't examine the actors' hand positions too closely (their actual performance comes courtesy of the Brentano Quartet, classical music fans). The main problem with the film is that the contrived script frequently fails to ring true and constantly threatens to descend into soapy melodrama. On top of everything else, it's extremely hard to believe that these four emotionally volatile people have spent the last 25 years in perfect harmony; Robert and Juliette, in particular, seem one wrong note away from divorce. Despite some issues with the contrived script, A Late Quartet is an entertaining drama that's ultimately worth seeing for the trio of terrific performances from Hoffman, Keener and Walken.